Artist Lina Iris Viktor Navigates the Entangled History of Liberia and the U.S.
Lina Iris Viktor’s first solo museum exhibition opens at the New Orleans Museum of Art in October. I feel like there are people who can look at the work—be they black or white, it doesn’t matter—who will take something powerful away from it, because it’s about the human experience,” says Lina Iris Viktor as we discuss her solo exhibition at the New Orleans Museum of Art, which opens October 5. 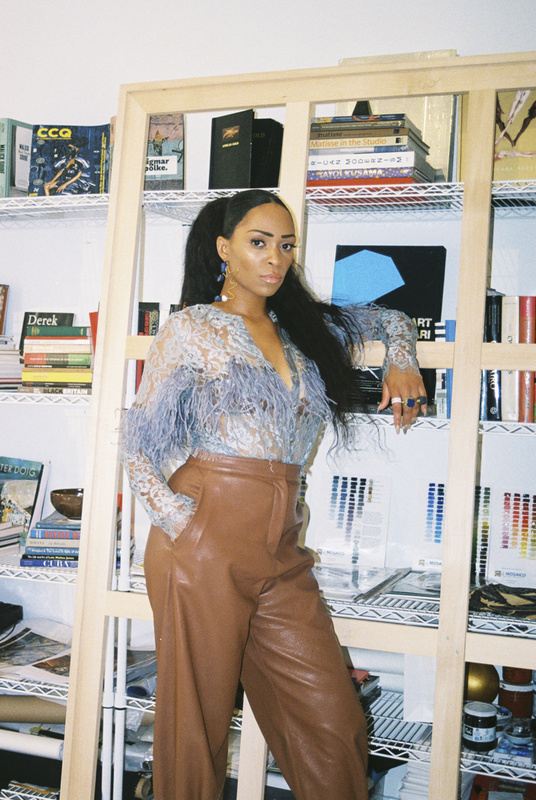 Beautiful references to Malick Sidibé, Chris Ofili and David Hockney are plastered on one wall of her whitebox studio, located in the heart of New York’s Financial District. On the other side of the space is a robust library brimming with monographs of figures including Samuel Fosso, Yayoi Kusama, Keith Haring and Alexander McQueen. While we chat, her young studio manager diligently works on production in the corner. It’s a humid July afternoon and I’m visually drinking in works-in- progress that will appear in the show, “Lina Iris Viktor: A Haven. A Hell. A Dream Deferred.” The exhibition’s title aptly addresses the fraught and convoluted historical trajectory of Liberia, Africa’s first republic. 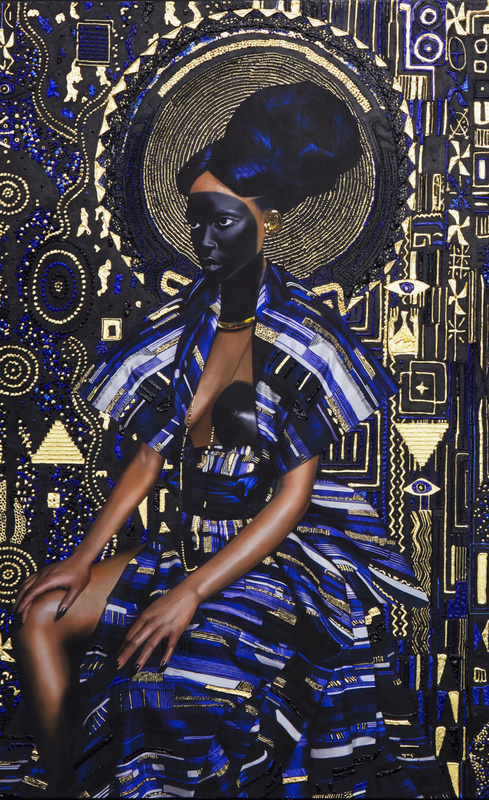 Viktor’s Yaa Asantewaa (2016), with pure 24-karat gold and acrylic on canvas. Viktor is producing 11 works for the exhibition—some on canvas, some on paper—utilizing primary source materials such as 19th-century tribal maps of the west coast of Africa (used by the ACS during the formation of Liberia). 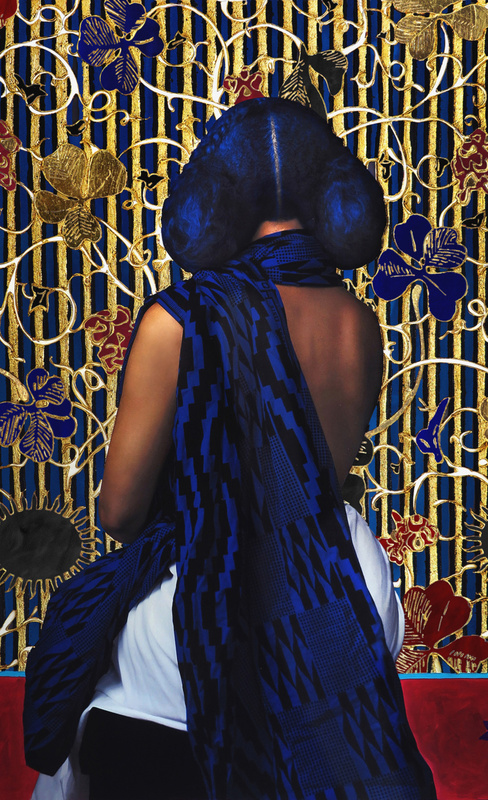 She also depicts regional hairstyles, traditional and contemporary textiles, West African portrait studio photography and Viktor herself as a Libyan Sibyl. “Viktor brilliantly reframes the myths of the founding of Liberia, a free nation created by the oppressors for the oppressed. She embodies a postmodern Sibyl who prophesies a disruption and a possible return to the origins,” explains gallerist Mariane Ibrahim, who has represented Viktor since 2017. During Viktor’s research, in linking Liberia to New Orleans, she encountered an enigmatic and controversial figure of New Orleanian history: the wealthy slave-owning John McDonogh, who is widely known across Louisiana as the benefactor of the public education system in New Orleans with schools named after him and a monument to his memory in Lafayette Square. McDonogh was behind a shrewd manumission scheme, where slaves could buy their freedom in 15 years time—during which McDonogh would continue to profit from their labor. As a chief member of ACS, McDonogh was key to the organization and many of his former slaves were among the first wave of immigrants to populate Liberia.